Ellsworth provides a wide range of recreational facilities for the entire family. Whether you like to fish, hunt, golf, swim, snowmobile or ride ATV's, the Ellsworth area has it all. Fish: For fly anglers, this area of Western Wisconsin is a little like heaven on earth. The Kinnikinnic to the north of Ellsworth and the Rush River to the east, provide hours of trophy trout fishing for the serious angler or just those interested in spending an afternoon in fishing paradise. The Kinnikinnic boasts one of the densest trout populations in Wisconsin with over 3000 fish per mile on the lower portion and over 6000 per mile on the upper portion. The Rush River begins its journey just south of Interstate-94 near Hammond and runs to the Mississippi 50 miles downstream. One can expect to encounter Brown, Brook and Rainbow trout in the Rush. 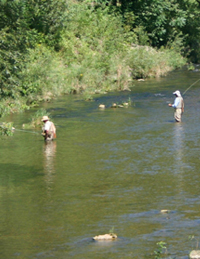 Other area trout streams include the Trimbelle, Eau Galle and Cady Creek and small spring creeks that feed the Kinnikinnic and Rush. If you are looking for game fish like walleye, smallmouth bass, and muskies, both the St. Croix and Mississippi River border Pierce County to the west. These rivers also support good populations of catfish, sturgeon and panfish. The Ellsworth Rod & Gun Club and Eau Galle Rush River Sportman's Club both serve the Ellsworth area. Golf: The area boasts two local golf courses: the Ellsworth Country Club and Kilkarney Hills. Those looking for an inexpensive day of golfing on a challenging and scenic course that will test their skills should check out the Ellsworth Country Club. This par-37, nine-hole course and clubhouse with locker room, bar and banquet facilities is open to the public. The Country Club also offers cart rentals and practice driving nets. The course lends itself to the rolling hills and forests of the nearby scenery, which makes for a challenging nine- or 18-hole experience that's reasonably priced. Memberships are available. Located two miles north of Ellsworth on Hwy. 65. Yardage is 3,111 (blue tees), 3,015 (white) and 2,609 (red). Call for tee times: 715-273-4438, or visit their website here. Kilkarney Hills offers a beautifully manicured course in a country setting for golf without all the distractions of a metropolitan golf course development. Enjoy their peaceful and challenging 18-hole golf course; a fun and friendly atmosphere on a course that will challenge all of your individual golf skills. For more information, call 715-425-8501 or visit their website here. Snowmobile: Ellsworth serves as the hub for Pierce County’s 222 miles of snowmobile trails, which run through the scenic countryside, including wooded areas and open rolling hills. The county has 10 snowmobile clubs and a governing body of volunteers. The trails are groomed and maintained by the council, which also regulates the opening of the trails. The county's snowmobiling trails are state-funded through registration fees and an allocation of gas fees. Anyone interested in joining a club can call 715-639-6311. For information about the condition of the trails, call 715-639-6311 or visit their website here. ATV Trails: As of June, 2009, a limited number of Townships in Pierce County have approved the year-round use of ATVs on town roads as detailed below. ATVs are NOT permitted on any US highways (e.g., US 10 or US 63), Wisconsin State highways (e.g., Hwy 29, Hwy 72, or Hwy 128), or Pierce County highways (e.g., Cty B, Cty C, Cty P, etc). ATVs are permitted on County N and G in the village of El Paso and a section of county B South of Spring Valley as signed. ATVs are also NOT permitted on township roads which have not been signed as designated ATV Routes. Please observe these restrictions and the privilege to ride on these roads. The Pierce County ATV Association is a group of All-Terrain Vehicle (ATV) enthusiasts located in Pierce County. The PCAA was organized to support local ATV enthusiasts, promote safe and responsible riding habits, and work with state and local government agencies to design, designate, establish, and maintain ATV trails and routes in Pierce County. For more information and to download trail maps, visit their website here. Shoot & Hunt: Located in Ellsworth Township and established in 1975, the Pierce County Shooting Range provides a supervised recreational activity that is open to the public on a scheduled basis. The range is also utilized by various Pierce County law enforcement agencies for training purposes. The Pierce County Shooting Range Committee, a subcommittee of the Pierce County Parks Committee, manages the range, which is a semi-secure outdoor facility consisting of three separate shooting lanes to accommodate various types of firearms. The facility has various types of shooting benches, rests, targets, and a small storage shed. Each shooting lane is divided by an earthen berm located approximately one mile north of the Village of Ellsworth. The property surrounding the range is primarily deciduous forest under private ownership. For more information, visit their website here. Swim: Located adjacent to Ellsworth Middle School on Panther Drive in Ellsworth, the Klaas-Jonas Swimming Pool has a slide, shower and locker room facilities and is covered by an inflated dome in the winter. For more information, call 715-273-0754 or visit their website here.